An observer moving on a timelike circular orbit around a Schwarzschild black hole experiences a geodesic precession depending on his velocity and the radius of the circular orbit. The black disk represents the black hole with Schwarzschild radius . The local reference frame of the moving observer (red) is given with respect to the Frenet–Serret frame at the current position of the object. Move the proper time slider to see how the local reference frame rotates. For an observer on a circular orbit around a Schwarzschild black hole, we can first define his distance to the black hole scaled by the Schwarzschild radius . The second parameter defines his velocity with respect to a static observer at the current position of the moving observer scaled by the velocity of light . 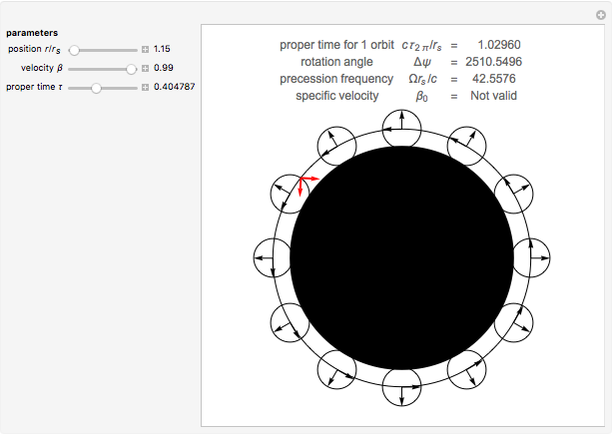 Then the orbit is parametrized by the proper time of the moving observer. For one full orbit, the moving observer needs , with . After this time, the local reference frame of the observer has undergone a rotation of , which follows from the Fermi–Walker transport. The corresponding precession frequency reads . If the local reference frame does not rotate, the velocity has to be ; however, this is only valid for . Detailed discussions of the circular motion around a Schwarzschild black hole can be found in the following references. T. Müller and S. Boblest, "Visualizing Circular Motion around a Schwarzschild Black Hole," forthcoming publication in the American Journal of Physics. T. Müller and F. Grave, "Motion4D—A Library for Lightrays and Timelike Worldlines in the Theory of Relativity," Computer Physics Communications, 180(11), 2009 pp. 2355–2360. D. Bini, et. al., "Physical Frames along Circular Orbits in Stationary Axisymmetric Spacetimes", General Relativity and Gravitation, 40(5), 2008 pp. 985–1012. Thomas Müller "Geodesic Precession on a Timelike Circular Orbit around a Schwarzschild Black Hole"